CDTV software and CD-32 software, hardware, games and accessories. Most of the software for CDTV will also work on the CD32 game machine and Amiga 500 (with optional Amiga 570 CD rom drive) or other compatible configuration. CDTV Remote. 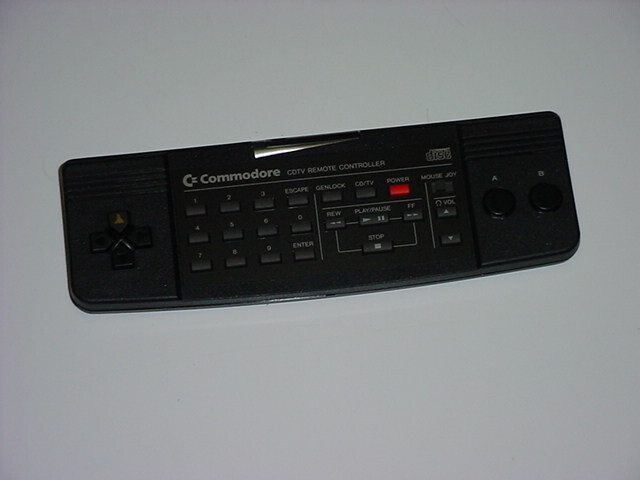 Original Replacement remote for Commodore CDTV system. No batteries included. New $39 ea. Repair chips for CDTV. See Amiga chip listing. CD-32 Game System. Call or email for availability and pricing. CD-32 games. Call or email for availability and pricing. Welcome CD original CD. (Interactive disk explains how to use the CDTV and tells about available software and accessories) $37 Used. Might be noticeably scuffed or scratched but guaranteed to work. CDTV Genlock (for overlaying video titles on VCR action). Now you can overlay your home videos with titles and graphics using your Commodore CDTV! Used but in originial box and guaranteed! Includes genlock CD software (demo) disk as described below. This card can also be used to replace a failed video output card on a CDTV machine which may be causing your CDTV to not have a picture. Has composite input and output as well as S-video output. This item has an NTSC composite output and may not be suitable for European PAL monitors and telvisions or European video recording systems. Sold Out. CDTV Video card (with RF output). Same as originally came with CDTV. Has RF output, composite video output and S-video output. Used. Email for price and availability. CDTV monitors available. Please see Commodore and Amiga listings for details. CDTV keyboard. Used. Original black CDTV keyboard in good condition. Sold. Amiga 2000 Keyboard. Please check our Amiga listing for availability or call or email for price and availability. 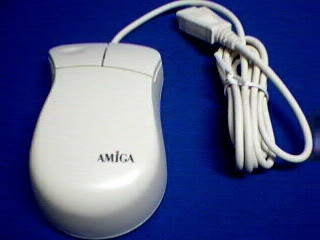 New Amiga mouse (works on Amiga and on CDTV with brickette). See Amiga section for current price. Used External Floppy Drive for CDTV. See Amiga floppy drives. CDTV troubleshooting information. Click here. CD caddies! These CDTV caddies (also referred to as CD cartridges or CD holders) also fit many other older CD drives. If you've been having a hard time finding a caddy for your CDTV get one now while you still can! These are white, off-white or gray. No black caddies available. These used caddies may have small labels on the bottom and side from previous application. Click camera below to view photograph of sample caddies. Used caddies just $7 ea. or get 3 or more for just $6.50 ea! Barney Bear Goes to School (Fun pre-school & early school educational experiences for children) $22 new or $17 used. Excellent Interactive Storybook Titles: NEW LOWER PRICES! Cinderella, Mud Puddle, Peter Rabbit, Moving Gives me a Stomach ache, Thomas's Snowsuit $17/ea. NOTE: Most of these CDTV disks also run on the CD32 game machine! Many of these programs have incredible features such as excellent graphics, sound effects, voice, searching features, on screen definitions, huge amounts of information (up to 670 megabytes per disk) and foriegn language capabilities! If you see something that you like we strongly recommend that you get it as soon as possible to insure availability. These titles are in high demand and some are in scrace supply! The CDTV also runs some of the new CD32 games! Don't forget the huge number of Amiga floppy programs which we have that work on the CDTV with an external floppy and/or keyboard. Remember: orders under $45 must add $8 for U.S. addresses. Additional shipping is required for locations outside of the United States. Contact us for shipping if ordering from outside of the United States. Wanted: Used CDTV systems and keyboards in good condition and affordable. If you have any available or know where to find any please contact us. Computer Bargain Store, 3098 S. Highland Drive, Suite 420A, Salt Lake City, Utah 84106.